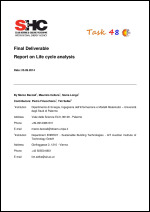 This technical report describes the research activities developed within Subtasks A2 “Life cycle analysis at component level” and B3 “Life cycle analysis at system level”. Subtask A2 is focused on developing studies to assess the energy and environmental performances of components of solar cooling and heating (SHC) systems. In detail, the Life Cycle Assessment (LCA) approach applied to SHC systems, started by IEA Task 38, is further developed to give a ready to use collection of datasheets allowing estimating the energy and environmental impacts of different SHC systems during their life cycle. The results of the activities developed within Subtask A2 are used to update and complete a database of life cycle inventories for components of SHC systems, already developed within Task 38, to be used for the development of a LCA method tool. As outcome of Task 38, two machines have been already analysed: PINK PSC-10 (12 kW) with H2O/NH3 and SorTech AG ACS 08 (8 kW) with H2O/Silica Gel. In addition, the energy and environmental impacts of other components of SHC plants have been assessed (e.g. solar thermal collectors, gas boiler, pumps, etc.) starting from data of international LCA databases. As outcome of Subtask A2 of Task 48, the energy and environmental impacts of Pink PC19 Ammonia Chiller and of a Packed Adsorbed Bed have been assessed and the database of life cycle inventories for components of SHC systems, developed within Task 38, has been updated and completed. Furthermore the LCA database now includes solar PV components (photovoltaic panels, inverter, storage, etc.) giving the possibility to perform analysis on conventional systems which use renewable electricity with or without connection with the grid. Subtask B aims at developing a user-friendly LCA method tool, useful to calculate the energy and environmental impacts and the payback time indices of different SHC systems and to compare SHC systems and conventional ones. The tool contains the database developed in Subtask A2. An important step of the tool development has been the analysis of international LCA databases to check the LCA data availability for components of the SHC systems and for conventional equipment (pipes, pumps, electric components, photovoltaic panels, etc.). Within Subtask B, the results of the SolarCoolingOpt project are also illustrated.